Designer Handbags Smart embroidered accents for any bag is an 'out of the box approach' to making handbags. Nancy Zieman and Eileen Roche created the techniques featured in this book and video to produce professional results using an embroidery machine. Designer Handbags combines Eileen's love for machine embroidery and Nancy's love for sewing into three cleverly designed bags. Together, the two sewing and embroidery experts will demonstrate how to create flawless bags that are full of personality and functionality. professional results using an embroidery machine. Designer Handbags combines Eileen's love for machine embroidery and Nancy's love for sewing into three cleverly designed bags. Together, the two sewing and embroidery experts will demonstrate how to create flawless bags that are full of personality and functionality. Simple to Sew! Create handbags with a flat bottom-- just 3 seams to sew! Customize! Use the bag dimensions suggested in the book or choose your favorite pattern or bag template. Nancy and Eileen designed this product to ensure flawless results. demonstrates how to create straps and attach them with machine embroidery. 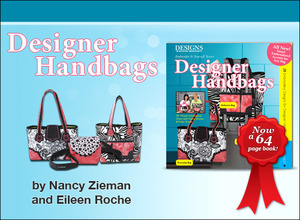 trim designs transform a rectangle of fabric into a fashionable handbag. Use What You Have! All the samples shown use regular quilting fabrics. We'll even share our tips for using any fabric! Of course, as the designer, you have the freedom to experiment with ultra suede, canvas, upholstery or outdoor fabrics. Creativity! You'll find corner trim, strap connector and tab designs in three coordinating mini-design collections: Marquee, Scoop and Scallop. Mix and match for your own custom bags. This software runs on a DVD-ROM or DVD-R drive on your computer. Software requirements: Embroidery software and/or hardware to transfer design files from CD to embroidery machine.